Snow? Hail? What is it? Let it snow, let it snow, let it… hail? So, when is hail confused as snow? When you live in Phoenix and little white fluff balls cover the ground. Okay, okay; the hail was very, very slushy, it could have been snow right? And, if you can gather up the fluff balls and make a ‘snowman’ that should count. Who cares what anyone else says. Did you see that cactus? It’s covered in white so it has to be snow dadgumit! I considered googling it to find out when falling white fluff balls morph from snow to hail, but who am I to burst anyone’s bubble, especially the news reporters standing out in the weather, all bundled up for the near freezing flurry. Under some atmospheric conditions, snow crystals may encounter supercooled water droplets. These droplets, which have a diameter of about 10 µm (0.00039 in), can exist in the liquid state at temperatures as low as −40 °C (−40 °F), far below the normal freezing point. Contact between a snow crystal and the supercooled droplets results in freezing of the liquid droplets onto the surface of the crystal. This process of crystal growth is known as accretion. Crystals that exhibit frozen droplets on their surfaces are referred to as rimed. When this process continues so that the shape of the original snow crystal is no longer identifiable, the resulting crystal is referred to as graupel. 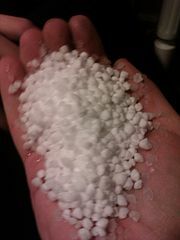 Graupel was formerly referred to by meteorologists as soft hail. However, graupel is easily distinguishable from hail in both the shape and strength of the pellet and the circumstances in which it falls. Ice from hail is formed in hard, relatively uniform layers and usually falls only during thunderstorms. Graupel forms fragile, oblong shapes and falls in place of typical snowflakes in wintry mix situations, often in concert with ice pellets. Graupel is also fragile enough that it will typically fall apart when touched. There you have it. It really and truly was snow… wait… it snowed? In Phoenix, it snowed? Whoohoo! It snowed in Phoenix! It snowed in Phoenix! Did you see that white stuff on the cactus, it’s snow! Wow, I was like, totally driving in snow… in Phoenix. Holy crow, I’ll never forget that… did you see the picture on facebook, my nephew actually made a snowman from snow; that fell from the sky… in Phoenix.